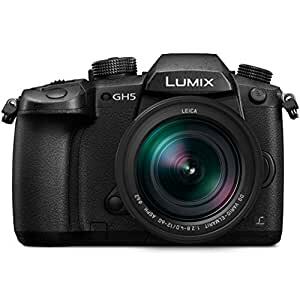 This professional grade Panasonic LUMIX GH5 kit with LEICA DG VARIO-ELMARIT 12-60mm F2.8-4.0 Lens is part of a mirrorless camera system that offers over 30 LUMIX and Leica compact lens options built on the next-generation (ILC) interchangeable lens camera standard [Micro Four Thirds] pioneered by Panasonic. With the exclusive LUMIX 4K PHOTO (~8MP, 30/60 fps) & brand new 6K PHOTO mode (~18MP, 30 fps), simply pause that perfect moment from video to produce printable high-resolution photos. Its “mirrorless” design enables a lighter, more compact camera body that includes cutting-edge 4K 60p (4:2:0 8-bit) and 30p (4:2:2 10-bit) in-camera cinematic video, 5Ghz Wi-Fi + Bluetooth for fast connection and image transfer, lightning fast DFD focusing, Dual I.S 2.0 stabilization and exposure technologies not possible with traditional DSLRs.